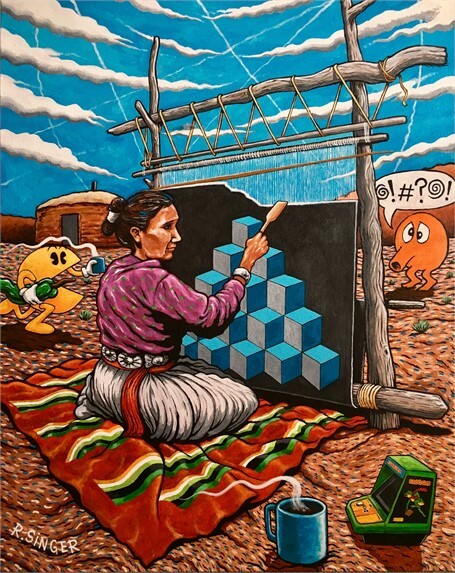 Ryan Singer, a Diné (Navajo) artist, currently resides and works out of his studio in downtown Albuquerque, New Mexico. 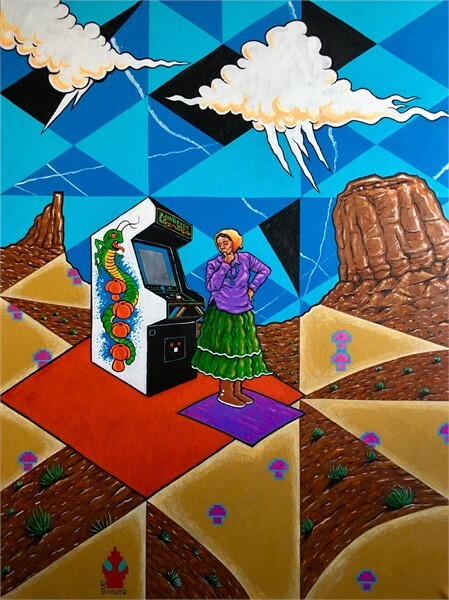 Noted for his use of vibrant colors, juxtapositions of traditional Native imagery with popular culture, and his satirical portrayals of modern Indian identity, Ryan has garnered numerous awards including the first ever “Adult Smile Award” at the 2008 SWAIA Santa Fe Indian Market. 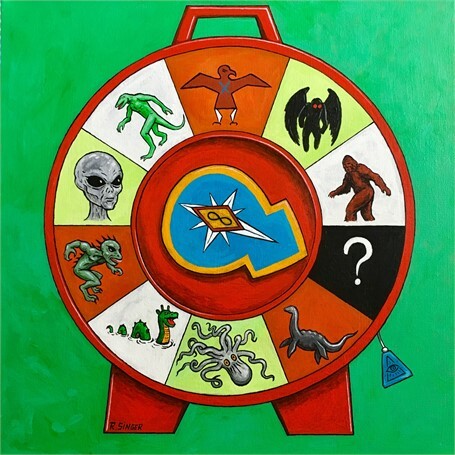 Bringing his unique variety of acrylic paintings, silkscreen prints, and pen/ink drawings, Ryan has participated in art markets across the southwest including the Heard Museum Indian Market, Museum of Northern Arizona’s Navajo Festival of Arts and Culture, and in the renowned, Santa Fe Indian Market. 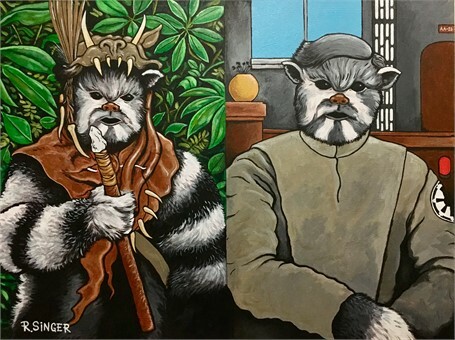 Born in Cedar City, Utah, but originally from Tuba City, Arizona, Ryan is of the Tódich’iinii (Bitter Water) clan and born for the Kinya’aani (Towering House) clan. 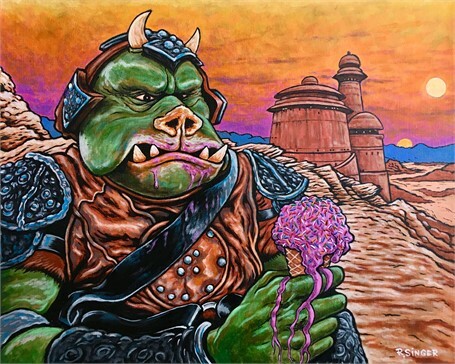 Having grown up in various parts of the Navajo Reservation, Ryan often reflects on his childhood in his artwork through his depictions of science fiction icons such as those seen in his paintings of Star Wars characters. 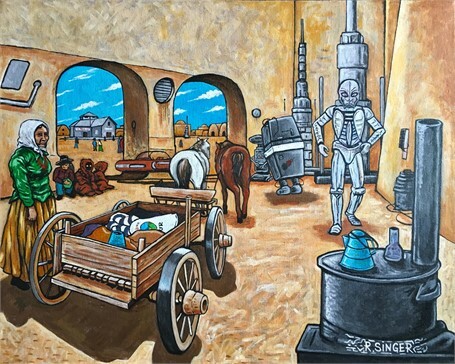 Ryan’s other notable works of art include the popular “Mutton Stew” painting which he modeled after Andy Warhol’s “Campbell’s Tomato Soup Can” series but with a distinct Navajo twist; his iconic “Wagon Burner” which has become his trademark symbol; and his recognizable series of robots. 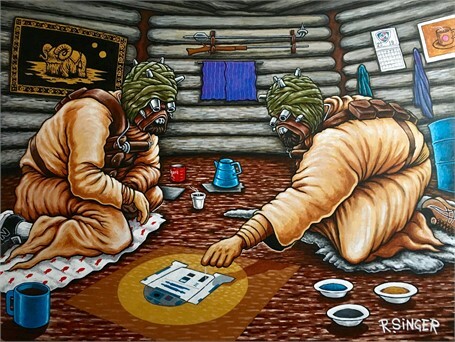 And riding on his success from the 2008 SWAIA Indian Market, Ryan’s painting of an elderly Navajo woman was featured on the January/February 2009 Issue of Native Peoples magazine. 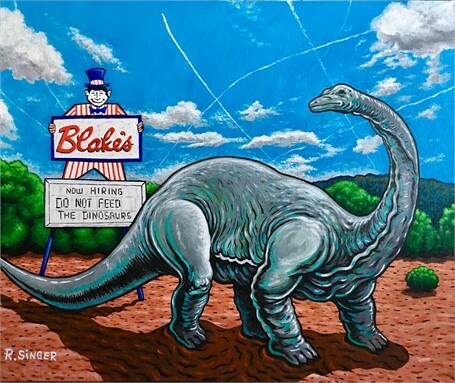 Heavily influenced by the punk music and underground art scenes, his work is often considered to be a part of a “new wave” of young Native artists.